I saw this question on a forum recently and though the requirement may not be very common, it was certainly an interesting idea. At first I thought it wasn't possible but after little tampering with the registry, it turned out to be quite easy to achieve. Editing the registry is risky! If you're unsure or can't live with the consequences, don't do it. And remember, ALWAYS BACKUP! 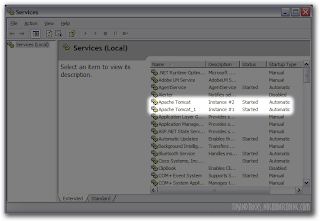 The instructions below are for Tomcat 6.0 which is installed as service on a Windows [XP] machine. 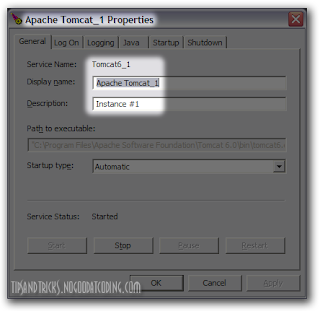 To begin with, these are the keys that are created by the Tomcat installer in the registry; you'll need to modify them. I'll refer to them by their numbers in the steps. Before you start the second service, you need to change the ports since otherwise it's going to start with exactly the same ones as your first service and throw exceptions and quit. (You could've changed the HTTP listen port while installing) You need to change the HTTP and SHUTDOWN listen ports at least. If either of these is the same or bound to some other process, Tomcat will not start. Ditto for <Connector port="8080" protocol="HTTP/1.1"
You can, of course, extend this to any number of services. fantastic post,its so useful.i found it very educational.